Now these are story books published by Scripture Union and I have to say I was pleasantly surprised. One often finds that stories that aren’t Bible stories, but are obviously Christian stories can be packed with blessed little thoughts and are really just a bit poofy. These one’s aren’t!!! They are fun and funky they have a page of easy reading for the adult person and then an illustrated page with two lines of really easy reading for your beginner reader. Each story is based on a short passage from the Bible and the Bible reading is at the end of the book. I like that with the Bible verse from the New Living Translation there is a rhyming paraphrase for little kids – very nice! And a couple of sweet activities are popped on at the end of the book, just to help you unwrap the message of the book. These would be great for reading at home or in a class… The books are all in one lessons!!! 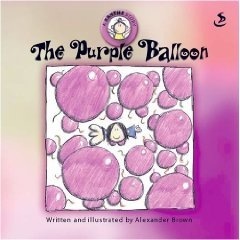 This story is based on Psalm 103:8-12 and is the story of a little girl, Xanthe, who feels bad about things she has done wrong in the past. Her mum explains that our forgiven sins are like balloons that float away out of reach… far far away never to return. Just like balloons they never come back!!! 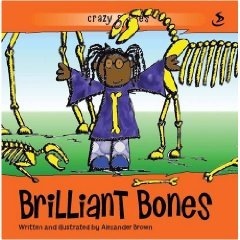 Brilliant Bones rhymes!!! 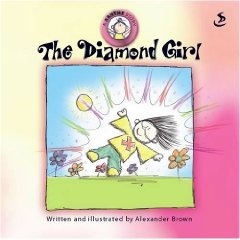 Gotta love a book that rhymes!!! It is the story of Harriet Carbuncle Petrifee Jones… who passionately gathers bones until she finds a marvelous treasure… and she sells all that she has collected for this one treasure. It is based on Matthew 13:44-46. If you would like to win these books then go ahead and enter our GiveAway. The GiveAway works in the usual way, comment before the end of this coming Friday, 12 February 2009, and we will draw and publish the winner next week on Sunday! – I won’t respond to your comments as I do on our other posts because I don’t want to be included in our own giveaway. Good luck and get commenting! pick me, pick me! They look fantastic! Those books sound lovely! Please enter me. Also, my Stephen Lungu book arrived via inter library loan. Thank you for the lead on the book — I’m looking forward to reading it! These look fantastic. I love books that incorporate scripture. these look lovely. My oldest still has a few years to go before he will learn to read, but I would love to save them for him. Would love to try again! Oh, those look super! Especially the one about the dancer. I too have not just one but THREE dancers in this household of girls, and in our tiny house, they drive me crazy twirling and leaping all over the show! Have a wonderful day, seven!!! These books sound wonderful! And pretty perfect for a 6 year old who also loves to dance! Yes, please! The kids would love them, I’m sure! Hope you’re having a good week! Ooo… look wonderful for my 2 and 4 year old! Thank you for having another giveaway. Wow these look great, thanks se7en for this offer! Definitely enter me! These books look awesome. I am a book fanatic and live in Costa Rica, where good books are hard to come by! I have four boys that would loooove this. 🙂 Thank you! And thank you for opening it up international!!! Count me in! They look fun! These books sound great. I know we’d love them here at our house. ooh, looks like some good ones. Count me in too! We would love these books to share with our foster children. They are avid readers and we want to help them grow their collection. It would be such fun for them! these look brilliant! great to discover some fab books. They look really cool, count me in … again! Hope you’re having a good week! PS: I’m trying your 15min decluttering trick – I’m amazed at how much can get done in such a short time! They look fun! Count us in. What fun books. Would love to win. Hi! I dó live on the upperside of this earth (the Netherlands) and I lóve to enter your give away! These books looks lovely, thank you!! By the way; I read your blog for a long time already and I love it.. Have fun with your eight lovely children! Hello there – great looking books. no 8 looking very cute these days!